By Sapna Mulki, Mike Clark-Madison, Shelly Gupta, and Ryan Orendorf A dvanced metering infrastructure (AMI), commonly referred to as "smart meter" technology, is currently far more prevalent in the electric sector than in water; however, a number of water utilities are increasingly considering the ways in which the technology can improve their operational efficiency. AMI allows utilities to track resource usage on a near real-time basis, which allows for better leak detection, demand-response management, billing accuracy, and effective revenue collection. Some utilities are also beginning to realize the benefits of improving customer satisfaction using AMI; however, this role for AMI is often overlooked or viewed as secondary. The water utility industry also realizes the need to prioritize "[p]ublic understanding of the value of water resources" and "[p]ublic understanding of the value of water systems and services" (AWWA, 2016). In a 2013 report, Bloomberg New Energy Finance predicted that U.S. water utilities will spend $2 billion on AMI through 2020 (Doom, 2013). This article focuses on the value that communications campaigns add to AMI investments by improving adoption of the technology and encouraging behavioral changes. 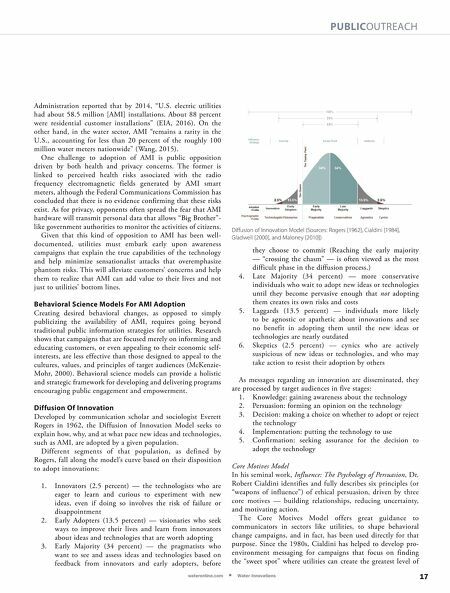 The Benefits Of AMI Technology Diffusion of new technologies has enabled consumers to gain access to, and utilize, a wider range of information than ever before, allowing them to better understand trends, habits, and choices and thus make more informed decisions that can improve their well-being. Technologies such as activity trackers (Fitbit), home automation hubs (Amazon Echo), and smart thermostats (Nest) have been adopted, after being marketed as devices that empower the consumers, by giving them data- driven insights into their own habits and behaviors. Water and electric utilities can now make similar technology available, but they are grappling with how to encourage a similar level of customer adoption and engagement. AMI helps utilities to connect with customers to share data about, and improve understanding of, water and energy usage at the residential and commercial levels. From the customer perspective, AMI represents an evolution of existing Internet of Things (IoT) technologies that already inform their water and energy usage, such as bill and data usage alerts to online accounts and mobile devices or remote management of building temperatures or security control systems. Since fully realizing the potential of AMI relies on customer engagement — not just adopting, but interacting with, the technology — AMI is being promoted as a tool to improve customer satisfaction. However, AMI also offers more direct operational advantages to utilities, such as: 1. Detecting leaks and occurrences of water theft 2. Promoting education on conservation at the residential and commercial levels 3. Building a sense of ownership and accountability among customers 4. Reducing operational costs from outdated methods of data collection and billing 5. Revenue realization through accurate billing 6. Targeted water efficiency messaging 7. Overcoming billing shock or surprise Challenges To Implementing AMI Technology While there are tangible benefits from AMI adoption, it requires a financial investment from utilities to pilot-test the technology (if they decide to go this route) and conduct cost-benefit analyses. Furthermore, changing over to new interfaces and learning new systems can be a significant barrier to overcome, especially for smaller water utilities. Electric utilities have made these investments more quickly; the U.S. Energy Information 16 wateronline.com n Water Innovations The Science Of Public Outreach — And Successful AMI Deployment As consumer buy-in is critical to the success of advanced metering infrastructure, so is behavioral science, in guiding utilities' engagement efforts around the technology. 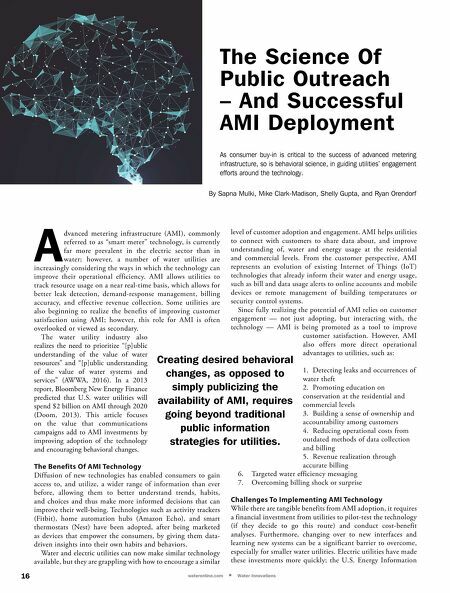 Creating desired behavioral changes, as opposed to simply publicizing the availability of AMI, requires going beyond traditional public information strategies for utilities.